Even at 20mph 17% of adults are killed or seriously injured when hit by a car. For children or older residents the figures will be worse. Why then do so many ignore the 20mph speed limits in place throughout Gosforth’s back streets? Walking to school should not be an extreme sport. This is the story of three of Gosforth’s back streets. One has a low volume of traffic mostly driving within the speed limit, somewhere we all might like to live and where children might reasonably be left to play outside. The other two suffer large volumes of traffic, a very large proportion of which is travelling faster than the speed limit. We’ve called these streets Street A, Street B and Street C, because we want to highlight the issues rather than the specific locations. Other streets in Gosforth are similarly affected. Street A – A quiet Street in East Gosforth. 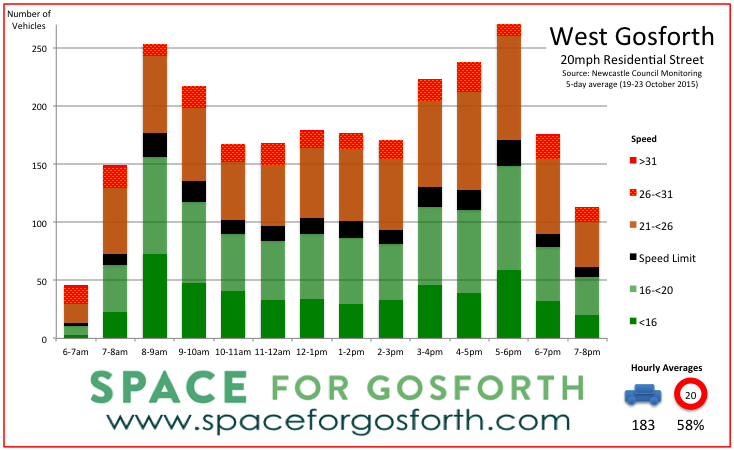 The graph below depicts traffic flows on Street A – a wide, lightly parked street in East Gosforth. The height of the bars shows the number of vehicles that passed in any given hour, while the colour shows the speed. Green denotes below the speed limit, with brown or red representing vehicles travelling greater than 20mph. Street A is not blocked, nor does it have any restrictions on speed or access or any traffic calming. In many ways Street A is lucky, for now, that most of the people who use it are those that live there or are visiting. And people who live there, or who walk or cycle along that street, we hope would feel safe. As shown on the bottom right of the graph, the average number of vehicles per hour between 6am and 8pm was 5 of which 80% were travelling at or below the speed limit. Many back streets in Gosforth are like Street A, but quite a few are not. Street B – A leafy residential street in West Gosforth. Lots of parents and groups of children walk along this street on their way to school or to after-school activities. It is also marked on the Newcastle Cycle Route Map as being suitable for cycling – although if you read the small print on the map it clarifies that this street could have varying amounts and speeds of traffic. Street B can be used in both directions without limitation, but parking on both sides of the street means there is only one lane that has to be shared by all vehicles. This, no doubt, acts as a form of traffic calming but also means drivers might not see a child waiting to cross the road. This street is within the 20mph zone west of the High Street – something local residents and Councillors supported in order to make their streets safer. When Newcastle City Council put a traffic counter on this street late in 2015 it found that on average 1,167 vehicles each weekday (42% of all traffic) were travelling faster than the speed limit. For Streets B and C we had to change the scale because there were so many more vehicles than on Street A. More than 150 vehicles use Street B every hour between 8am and 7pm, with peaks in the morning and evening where numbers exceed 250 vehicles per hour. 250 per hour equates to one vehicle every 14 seconds. Between 6am in the morning and 8pm at night the average number of vehicles per hour is 183. That’s one vehicle every 20 seconds – all day. If you are going to cross this street you need to be pretty careful. In addition to traffic volumes the counters also estimate vehicle types. Most of the traffic was cars. Also recorded each day were 342 Light Goods Vehicles (LGVs), 47 Heavy Goods Vehicles (HGVs) and 9 buses. In total 2,723 vehicles use this street every weekday. It is clear that this street is used by a lot of through traffic as well as by those that live there or who are visiting. Street B is Linden Road. Street C isn’t quite as busy as Street B (2,074 vs 2,773 vehicles on an average weekday) but has far more speeding vehicles. On average 1,765 vehicles (85% of all traffic) exceed the speed limit on Street C every weekday. Street C is back in East Gosforth, not far from Street A. It is not an especially wide street but for most of its length it has two traffic lanes so cars travelling in opposite directions can pass easily. Like Street B it is also used by parents and children walking to school as well as people walking to and from the Metro. Of the 2,074 vehicles recorded on average 194 were Light Goods Vehicles (LGVs), 15 were Heavy Goods Vehicles (HGVs) and 8 were buses. Clearly this street is also being used by through traffic. Street C is Ilford Road. We all know excessive speed can kill, but large volumes of traffic also increase the likelihood that someone, or some child, will be killed or injured. Excessive traffic also leads to pollution and noise, and reduces the quality of life for those who live on these streets. All the same issues that Gosforth High Street suffers from. 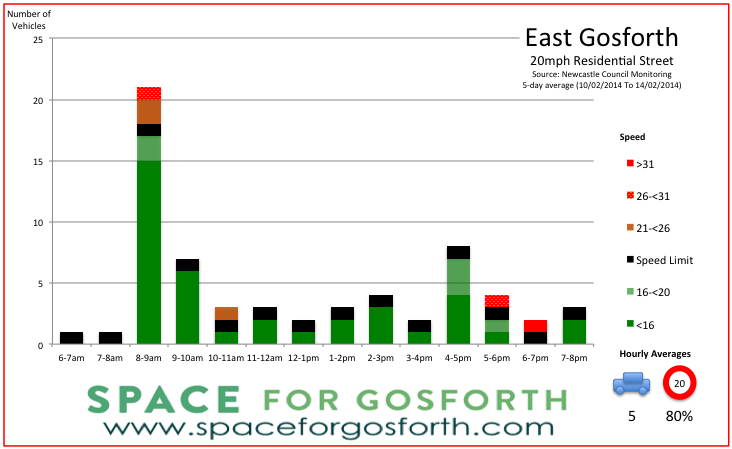 SPACE for Gosforth wants safer streets for Gosforth. Streets more like Street A where children can play out and where people of any age can walk or cycle without fear of the traffic. Other streets in Gosforth have been transformed. With the right support, the same could happen for Streets B and C.
SPACE for Gosforth will be leafleting the residents of these two streets. If you have received one of our leaflets, please tell us what you think. We thank Newcastle City Council for providing the traffic count data for these streets. I have lived on Rectory Drive since 1986 and am now a retired University academic. 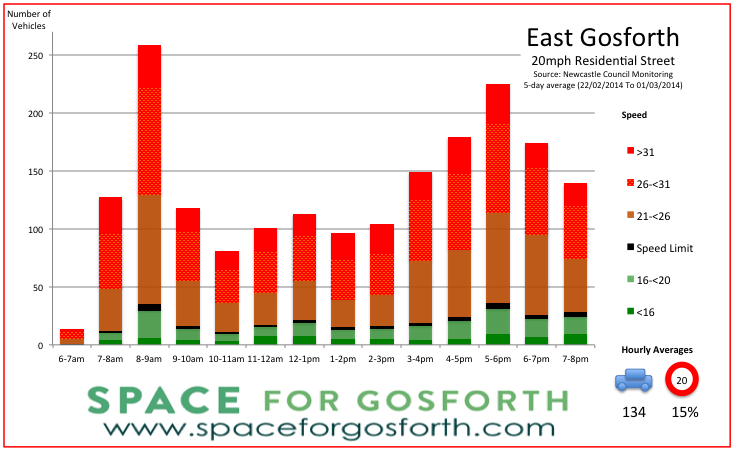 I was pleased to receive your leaflet through the door to introduce me to Space for Gosforth and to see the section about traffic speed on Ilford Road which concurs entirely with how I have felt for a long time – that most traffic on Ilford Road/Rectory Drive shows a disregard for the speed limit. I take pride in obeying speed limits (the most challenging being the 10 mph limit on Freeman Hospital grounds where I take my wife to work every weekday). There is a lot of pedestrian traffic taking kids to school and the speed of the traffic is a hazard as there is only a pavement on one side of the road with quite a few crossings for side roads and back alleys, and especially at the crossing point for Ilford Road Metro station and at the north end and south ends. The traffic flow was modified a year or two ago which seemed to solve none of the problems and cause a few additional ones. There is a long corridor between cars parked on both sides at the south end causing delays and confusion about rights of way and I have witnessed the fact that after north-travelling cars have negotiated the the south end of Ilford Road, they instinctively speed up towards the north end presumably to relieve their impatience and vent their frustration. Making it one way would solve the delays and congestion but not the speeding and a first step would be speed bumps (such as on Stoneyhurst Road – where they seem completely unnecessary due to the short stretches between junctions and winding nature of the road) and then a more radical solution of blocking off the north end junction with Stoneyhurst Road. But I will be very interested to hear what your proposed solutions are. John you are quite wrong to assume/state speed bumps on Stoneyhurst are unnecessary having lived right by one (14years) and a bend in the road it makes little difference to people’s speed come rush hour. Stoneyhurst for a good hour and a half becomes a race track/battle for supremacy over the 1 lane available due to parked cars given that by both the bend and the bump there’s a junction many cars still take these at speed. Traveling along ilford rd as I do I sympathise with what becomes a nonsensical scheme by the metro station for passing vehicles due to inconsiderate parking. However I can assure you other roads are affected by speeding. Thank you for bringing this to my attention. I live in Linden Road and have emailed the council on a number of occasions about the fact that it is used as a rat run by cars that want to avoid the High Street. Something that may well worsen if plans to slow traffic down on the High Street go ahead. Something needs to be done to slow traffic down on Linden Road before there is a serious accident. Installation of speed humps or making a no right turn into Linden Road for motor vehicles coming from Salters Road would I think improve the situation. The council have failed to look at the impact of their plans for the High Street on other streets in the area and are not interested in doing anything about this. I hope SPACE can help. Thanks for your comment, J, and glad you found the information on the blog useful. SPACE are a group of local residents who are hoping to campaign for safer and more pleasant streets in our area. We all live in the area and contribute our time where we can. It would be great if you could join us and help us to understand the problems and shape proposals for the future. Please get in touch if you’d like to contribute. Having recently moved to Linden Road six months ago I am extremely concerned about the excessive speed that most car and lorry drivers adopt when travelling down this route.In short ,there is a very high probability of a serious pedestrian/ motorist incident likely to happen! Why not install roadside technology that visually checks and warns drivers that their speed is too high and should be decreased ? This is already used in parts of Salters Road and can only make drivers more aware of the areas speed limit restrictions and their need to be more careful in an area where there are lots of schoolchildren and parked cars. Roadside technology wont work, as the ‘driver’ will only ignore it, not even notice its there or believe it’s not applicable to them as they are ‘good’ drivers. You need to educate the drivers so their driving exceeds the standards they are currently at, which are obviously deteriorating. After having a close call with a driver on the school run, whom needed to cross into oncoming traffic to pass a parked car. The excuse was, I wasn’t seen as there was a car in front of theirs. Please bear in mind, I noticed and also had headlights on to make sure everyone sees my vehicle. The fact they were approx 6 inches from the car in front wouldn’t have helped. I however, can not in all fairness put the blame just on the drivers. There has been plenty of occasions where pedestrians have/haven’t looked and still just crossed the road whether there is traffic or not. I’m not just talking about High school kids either, although for the most part, they are the main culprits. Parents getting their children out of their car onto the roadside rather than leaning across the back of the car or making them climb across are also issue causing. Please use common sense, if it’s a busy road, don’t get your kids out on the traffic side. Best case you hear a car horn, worst case you/your kids get flattened into the side of your car. Both pedestrians and drivers have a responsibility to themselves and each other not to put themselves in danger or in a position where they can cause themselves or others an injury. In my childhood we had the green cross code man, maybe we need a new up to date version. Heaven forbid we start fining pedestrians for bad road sense although if the government thought they’d make money from it, I’d assume it would be put in place. Hi. I’m a resident on Linden Road for last 21 years. The traffic has obviously increased over this period but significantly in last 2 years, and since roadworks started on Salters road / High St in last few months it’s almost as busy at times as the Hith St. To the point where drivers are using the back lane of Linden Road as the front street is too busy. Access to this area west of the High Strret and south of Salters a Road should be further restricted by speed humps and speed signs that highlight your speed, and if possible restrict to access only. But I’m sure with better physical restrictions that the problem could be solved. I for one would contribute a one off fee to bring this problem under control if “no budget” was an argument for leaving as is. Ilford road and the grove are popular rat runs, i live between both, while walking my dogs i regularly see drivers doing their best to beat the speed they recorded last time on the sensor recently installed on the grove, too often do i see it showing speeds over 40mph, rarely do i see it showing speeds 20mph and lower. Until a proper system is put in place that punishes the offenders in a way that affects them what point are these restrictions. As a cyclist and motorcyclist i am often overtaken in 20 zones when riding a motorbike, if this motorcyclist can abide by these rules what is wrong with the mentality of thise that do not. If that’s the average speeds on Street C then DfT guidelines have not been adhered to, you’re not supposed to set the speed limit below the mean average because speed limits are not traffic calming, it should not feel safe for most people to break the speed limit, this is just people driving the speed they feel comfortable driving given the width of the road and the sightliness available etc.